The Special Boat Service (SBS) is the special forces unit of the United Kingdom's Royal Navy. The SBS can trace its origins back to the Second World War when the Army Special Boat Section was formed in 1940. After the Second World War, the Royal Marines formed special forces with several name changes—Special Boat Company was adopted in 1951 and re-designated as the Special Boat Squadron in 1974—until on 28 July 1987 when the unit was renamed as the Special Boat Service after assuming responsibility for maritime counter-terrorism. Most of the operations conducted by the SBS are highly classified, and are rarely commented on by the British government or the Ministry of Defence due to their sensitive nature. The Special Boat Service is the maritime special forces unit of the United Kingdom Special Forces and is described as the sister unit of the British Army 22 Special Air Service Regiment (22 SAS), with both under the operational control of the Director Special Forces. In October 2001, full command of the SBS was transferred from the Royal Marines to the Royal Navy, while the green beret remained with the Marines. On 18 November 2003, the SBS were given their own cap badge with the motto "By Strength and Guile". This follows opening recruitment from only the Royal Marines to all three services of the British Armed Forces. The SBS has traditionally been manned mostly by Royal Marines Commandos. The principal roles of the SBS are Special Reconnaissance (SR), including information reporting and target acquisition; Offensive Action (OA), including direction of air strikes, artillery and naval gunfire, designation for precision guided munitions, use of integral weapons and demolitions; and Support and Influence (SI), including overseas training tasks. The SBS also provide immediate response Military Counter Terrorism (CT) and Maritime Counter Terrorism (MCT) teams. The operational capabilities of the SBS and the SAS are broadly similar. However, the SBS (being the principal Royal Navy contribution to UKSF) has the additional training and equipment required to lead in the maritime, amphibious and riverine environments. Both units come under the operational command of HQ Directorate of Special Forces (DSF) and undergo an identical selection process. They enjoy significant interoperability in training and on operations. All of the SBS's four squadrons, C, Z, M and X, are configured for general operations, and rotate through the Maritime Counter Terrorism Role, also known as Black Role. The SBS also operates on land, with recent operations in the mountains of landlocked Afghanistan and in the deserts of Iraq. Their main tasks include intelligence gathering, counter-terrorism operations (surveillance or offensive action), sabotage and the disruption of enemy infrastructure, capture of specific individuals, close protection of senior politicians and military personnel, plus reconnaissance and direct action in foreign territory. The Special Boat Section was founded in July 1940 by a Commando officer, Roger Courtney. Courtney became a commando recruit in mid-1940 and was sent to the Combined Training Centre in Scotland. He was unsuccessful in his initial attempts to convince Admiral of the Fleet Sir Roger Keyes and later Admiral Theodore Hallett, commander of the Combined Training Centre, that his idea of a folding kayak brigade would be effective. He decided to infiltrate HMS Glengyle, a Landing Ship, Infantry anchored in the River Clyde. Courtney paddled to the ship, climbed aboard undetected, wrote his initials on the door to the captain's cabin, and stole a deck gun cover. He presented the soaking cover to a group of high-ranking Royal Navy officers meeting at a nearby Inveraray hotel. He was promoted to captain and given command of twelve men, the first Special Boat Service / Special Boat Section. 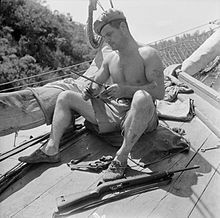 In April 1943, 1st SAS was divided, with 250 men from the SAS joining the Small Scale Raiding Force to form the Special Boat Squadron under command Major the Earl Jellicoe. They moved to Haifa and trained with the Greek Sacred Regiment for operations in the Aegean. They later operated among the Dodecanese and Cyclades groups of islands in the Dodecanese Campaign and took part in the Battle of Leros and the Battle of Kos. They, with the Greek Sacred Band, took part in the successful Raid on Symi in July 1944 in which the entire German garrison was either killed or captured. In August 1944 they joined with the Long Range Desert Group in operations in the Adriatic, on the Peloponnese, in Albania, and, finally, in Istria. So effective were they that, by 1944, the 200–300 men of the SBS were holding down six German divisions. Throughout the war, No.2 SBS did not use the Special Boat Squadron name, but instead retained the name Special Boat Section. They accompanied Major General Mark Clark ashore before the Operation Torch landings in November 1942. Later, one group, Z SBS, which was based in Algiers from March 1943, carried out the beach reconnaissance for the Salerno landings and a raid on Crete, before moving to Ceylon to work with the Special Operations Executives, Force 136 and later with Special Operations Australia. The rest of No. 2 SBS became part of South-East Asia Command's Small Operations Group, operating on the Chindwin and Irrawaddy rivers, and in the Arakan, during the Burma campaign. In 1946, the SBS, whether of Commando or SAS parentage, were disbanded. The functional title SBS was adopted by the Royal Marines. It became part of the school of Combined Operations under the command of "Blondie" Hasler. Their first missions were in Palestine (ordnance removal) and in Haifa (limpet mine removal from ships). The SBS went on to serve in the Korean War deployed on operations along the North Korean coast as well as operating behind enemy lines destroying lines of communication, installations and gathering intelligence. It was during the Korean War that the SBS first started operating from submarines. In 1952, SBS teams were held at combat readiness in Egypt in case Gamal Abdel Nasser's revolution turned more violent than it did. The SBS were also alerted during the Suez Crisis of 1956 and coup against King Idris I of Libya (1959), but in both cases they did not see action. In 1961, SBS teams carried out reconnaissance missions during the Indonesian Confrontation (see Operation Claret). In the same year, Iraq threatened to invade Kuwait for the first time, and the SBS put a detachment at Bahrain. In 1972, the SBS and SAS came into prominence when members of a combined SBS and SAS team parachuted into the Atlantic Ocean after a bomb threat on board the cruise liner RMS Queen Elizabeth 2. A thorough search of the ship found no evidence of any device drawing the conclusion that it was a hoax. The SBS conducted operations in Northern Ireland during The Troubles including with submarines. In January 1975, two SBS kayak teams were inserted from HMS Cachalot to conduct an anti gun running operation in the area between Torr Head and Garron. In 1977, their name was changed to the Special Boat Squadron and in 1980 the SBS relinquished North Sea oil rig protection to Comacchio Company. In 1982, after the Argentinian invasion of the Falkland Islands, they deployed to South Georgia. The only losses to the SBS during the Falklands War occurred when the SBS and SAS were operating behind the lines and two members of the SBS were shot by an SAS patrol, who had mistaken them for Argentinians. In 1987, they were renamed Special Boat Service, and became part of the United Kingdom Special Forces Group alongside the Special Air Service and 14 Intelligence Company. In the Gulf War, there was no amphibious role assigned to the SBS, an "area of operations line" was drawn down the middle of Iraq, the SAS would operate west of the line and the SBS to the east. As well as searching for mobile scud launchers, their area contained a mass of fibre-optic cable that provided Iraq with intelligence, the location of the main junction was 32 miles from Baghdad; On 22 January 1991, 36 SBS members were inserted by two Chinook helicopters from No. 7 Squadron RAF, into an area full of Iraqi ground and air forces as well as spies and nomads, avoiding them and destroying a 40-yard section of the cable with explosives, destroying what was left of the Iraqi communication grid. The SBS carried out one of its most high-profile operations when it liberated the British Embassy in Kuwait, abseiling from helicopters hovering above the embassy. They were also responsible for carrying out diversionary raids along the Kuwaiti coast which in effect diverted a number of Iraqi troops to the SBS area of operations and away from the main thrust of the coalition build up. In September 1999, about 20 SBS members were involved in the Australian led International Force for East Timor (INTERFET) in East Timor. Together with the Australian Special Air Service Regiment and the New Zealand Special Air Service they formed INTERFET's special forces element named Response Force. Response Force departed from Darwin by C-130 Hercules transport aircraft and flew into Dili tasked with securing the airport, a seaport and a heli-port to enable regular forces to land and deploy with the SBS filmed driving a Land Rover Defender out of a Hercules. Response Force was then utilised to perform to a variety of tasks including direct action and special reconnaissance throughout East Timor. The British forces withdrew in December 1999, including the SBS. Sergeant Mark Andrew Cox was awarded the Military Cross after his patrol came under fire from pro-Indonesian militia. In September 2000 the SBS was involved in Operation Barras, a hostage rescue operation in Sierra Leone. 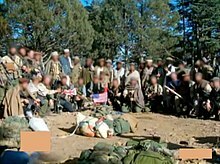 In November 2001, C and M squadron SBS had an extensive role in the invasion of Afghanistan at the start of the War in Afghanistan, notably, members of M squadron were involved in the Battle of Tora Bora. The SBS was integrated directly into Task Force Sword – a Black SOF, under direct command of JSOC, this was a so-called hunter-killer force whose primary objective was capturing or killing senior leadership and HVT within both al-Qaeda and the Taliban. Troops from C squadron (reinforced by teams from X and Z squadron, with at least one SEAL attached to them) were tasked with several missions, some with General Dostum's Northern Alliance forces at Mazar-e-Sharif. On November 10, C squadron inserted into the recently captured Bagram Airbase, which caused an immediate political quandary with the Northern Alliance leadership which claimed that the British had failed to consult them on it before the deployment, in addition to fighting with Dostum's forces, they worked alongside TF Sword in Shah-i-Kot Valley. Members of M squadron SBS, were involved in a prison revolt during the Battle of Qala-i-Jangi, members of the SBS along with US and Northern Alliance troops eventually quelled the uprising, however during one CAS mission, a misdirected JDAM bomb wounded 4 SBS personnel to various degrees. In appreciation for the SBS contribution to the battle, the CIA attempted to recognise the personnel with US decorations, but due to Military and political bureaucracy, the decorations were never awarded. The SBS continued to work with Task Force Sword and the CIA. In Spring 2005, the Director of Special Forces re-balanced British special forces deployments so that Afghanistan would be the responsibility of the SBS and Iraq would be the 22nd SAS Regiment's. In Spring 2006, the British military deployed over 4,000 troops to southern Afghanistan and the SBS were assigned to take the lead in supporting the deployment. The SBS were part of Task Force 42/84: the British contingent in the Joint Special Forces command; their deployment with other British special forces units was codenamed Operation Kindle (similar to the SAS and other British SF deployment in Iraq, known as Operation Crichton); the SBS carried out missions all over southern Afghanistan with US Apache helicopters. Along with training and mentoring Afghan Provincial Response Companies, Afghan police tactical units the operated jointly with Coalition SOF, TF 42 conducted operations in direct support of the British Battle Group deployed in Helmand Province and for ISAF SOF Command and operations directly for the Americans in pursuit of high-value targets. The main objective of the SBS (and later on other British special forces units with Afghan forces) was targeting Taliban leaders and drug barons using "Carrot and stick" tactics. On 27 June 2006, a 16-man unit from C Squadron and members of the SRR carried out Operation Ilois: an operation that silently captured 4 Taliban leaders in compounds on the outskirts of Sangin, Helmand province. As they returned to their Land Rover vehicles, they were ambushed by an estimated 60-70 Taliban insurgents, with one vehicle disabled by RPG fire, the team took cover in an irrigation ditch and requested assistance while holding off the Taliban force. The Helmand Battle Group had not been informed of the operation until it went wrong; a QRF made up of a platoon of Gurkhas responded but ran into another insurgent ambush; one SBS member was seriously injured in the ambush. After an hour-long gunfight (some sources say three hours[which? ]), Apache attack helicopters, the Gurkha QRF and the 16-man unit, supported by a U.S. A-10 Thunderbolt and two Harrier GR7s managed to break contact and return to the closest FOB; two of the four Taliban leaders were killed in the firefight while the other two escaped in the chaos. Upon reaching the FOB it was discovered that Captain David Patton, SRR, and Sergeant Paul Bartlett, SBS were missing – one was helping wounded out of a vehicle when he was shot and assumed killed, and the other went missing during the firefight. An RAF Chinook carrying a company from the Parachute Regiment took off to find them, a pair of Apaches spotted the bodies and the Paras recovered them. One SBS member was awarded the MC for his actions in the ambush. On 12 May 2007, an SBS team killed the Taliban leader Mullah Dadullah after JSOC and the ISA tracked him to a compound - where his associates were meeting - near Bahram Chah, Helmand province. The ISA confirmed he was there and an SBS reconnaissance element carried out reconnaissance of the compound which showed that Dadullah was protected by 20 insurgents. That night, with the ISA monitoring the target, the majority of C Squadron were inserted by RAF Chinook HC.2 helicopters while Apache helicopters provided cover. The troops stormed the compound and an hour long firefight took place as small groups of Taliban were hunted down and killed. Four SBS personnel were wounded (one seriously). Eventually Dadullah was shot in the chest and head, a brief SSE was conducted and the assault force was picked up by helicopter. On 29 July 2007, members of the SBS were carrying out a special mission in Nimruz when they were involved in a firefight with Taliban insurgents, Lance Corporal Michael Jones was killed and three other members were wounded. On 24 September 2007, members of C squadron SBS and the Italian SOF unit Col Moschin rescued two Italian intelligence agents who were kidnapped two days before by the Taliban in Herat province near Farah. Col Moschin parachuted onto a drop zone and marched overnight to surround the target compound, while the SBS were standing by in Lynx and Chinook helicopters to provide cut off groups in case the insurgents attempted to escape. A US Predator drone also supported the British and Italians. The insurgents brought the hostages out of the compound and loaded them into vehicles before the Italians were in position to rescue them, but the SBS closed in on the vehicles: aerial snipers using M82A1 antimaterial rifles forced the vehicles to stop. A Chinook dropped off more than a dozen SBS personnel who engaged the Taliban who were disembarking the vehicles. Eight Taliban insurgents were killed and the hostages were rescued, although one died of gunshot wounds. On 18 February 2008, Taliban leader Mullah Abdul Matin and one of his sub-commanders, Mullah Karim Agha, along with several bodyguards were travelling through the desert near Gereshk, Helmand province on motorbikes when they were ambushed and killed by an SBS unit dropped into his path by helicopter. In February 2009, members of the SBS took part in Operation Diesel, which resulted in the seizure of £50 million of heroin and the killing of at least 20 Taliban insurgents. On 29 August 2009, Sergeant Lee Houltram of the SBS was killed by an IED during a Special Forces operation to destroy a bomb factory near Gereshk in Helmand province. On 9 September 2009, an SBS team supported by the SFSG rescued Times journalist Stephen Farrell from a Taliban safe house in Char Dara District, Kunduz Province after he and his Afghan interpreter had been captured by the Taliban while reporting on the Kunduz airstrike. The British special forces were forced to act when intercepted communications of the Taliban leader showed them discussing moving the hostages into Pakistan. They were inserted before dawn by 160th SOAR helicopters directly onto the target building. While the SFSG set up a cordon, the Afghan interpreter was accidentally shot and killed, and two civilians were killed by an explosive breaching charge on the compound. Although an SFSG soldier was killed, Farrell was successfully rescued. On 1 July 2010 during an operation against insurgents in Haji Wakil, Helmand Province, Corporal Seth Stephens of the SBS was killed during a heavy firefight while clearing a compound, as a result of his actions during that operation, he was awarded the Conspicuous Gallantry Cross. On 15 April 2012, during the Taliban attack on Kabul, SBS members cleared Taliban militants from a central location overlooking foreign embassies. A heavily armed insurgent suicide squad occupied a six-story, half-built tower block, and began firing small arms and RPGs on nearby buildings including the British and German embassies. SBS operators and Afghan troops fought a close quarters battle for eight-and-a-half hours to eventually clear the militants from the structure. The mission to end the siege is thought to have been one of the most decorated actions of Britain's involvement in Afghanistan, with several gallantry awards given to the participants. A combat assault dog, a Belgian Malinois known as Mali, received the Dickin Medal for his actions during the battle. Despite being badly injured by grenade shrapnel, Mali stayed by the side of his handler and continued to find safe routes for the British and Afghan troops as they fought their way up the tower floor-by-floor, preventing the operators from suffering major casualties. On 23 December 2013, Captain Richard Holloway was serving with the SBS when he was killed by Taliban small arms fire while conducting an operation to suppress the Taliban in a joint SBS-Afghan forces raid (with air support) on Taliban insurgents in a valley east of Kabul ahead of the Afghanistan elections. In the 2003 invasion of Iraq, M Squadron deployed to Jordan as Task Force 7, which was part of Combined Joint Special Operations Task Force - West (CJSOTF-West) and were earmarked for a heliborne assault on several Iraqi oil facilities that had their own desert airstrips that once captured would be used for special operations forces' staging areas. In northern Iraq in early March, a small reconnaissance team from M Squadron mounted on Honda All-terrain vehicles inserted into Iraq from Jordan, its first mission was to conduct reconnaissance of an Iraqi air base at al-Sahara. The team was compromised by an anti-special forces Fedayeen unit and barely escaped thanks to a U.S. McDonnell Douglas F-15E Strike Eagle that flew air cover for the team and the bravery of an RAF Chinook that extracted the team under the Fedayeen's 'noses'. M Squadron launched a second operation at full strength ("Zero Six Bravo"?) in a mix of land rovers and ATVs into northern Iraq from H-2 Air Base, the objective was to locate, make contact and take the surrender of the Iraqi 5th Army Corps somewhere past Tikrit and to survey and mark viable temporary landing zones for follow-on forces. However the Squadron was compromised by a goat herder; the SBS drove for several days while unknown to them anti-special forces Fedayeen units followed them. At an overnight position near Mosul the Fedayeen ambushed the Squadron with DShK heavy machine guns and RPGs, the SBS returned fire and began taking fire from a T-72, the Squadron scattered and escaped the well-constructed trap. A number of Land Rovers became bogged down in a nearby wadi, so the troops mined the vehicles and abandoned them - though several did not detonate and were captured and exhibited on Iraqi television. The SBS was now in three distinct groups: one with several operational Land Rovers was being pursued by the Iraqi hunter force, a second mainly equipped with ATVs was hunkered down and trying to arrange extraction, the third with just 2 personnel on an ATV raced for the Syrian border. The first group tried to call in coalition strike aircraft but the aircraft could not identify friendly forces because the SBS were not equipped with infra-red strobes - although their vehicles did have Blue Force Tracker units, they eventually made it to an emergency rendezvous point and were extracted by an RAF Chinook. The second group was also extracted by an RAF Chinook and the third group made it to Syria and was held there until their release was negotiated, there were no SBS casualties. The incident has since been commended by senior British officials. M Squadron also had a 3-month tour in early 2003. Corporal Ian Plank, an SBS member attached to the SAS was killed by Iraqi insurgents during a house-to-house search for a wanted high-ranking Islamist terrorist in an insurgent compound in Ramadi on 31 October 2003, he was the first UKSF combat casualty of the Iraq War. The SBS was also very active as part of Task Force Black, C squadron deployed to Baghdad as part of the task force in 2004, in its four-month deployment it mounted 22 raids. On 23 July 2005, M squadron, supported by troops from the SAS and US forces carried out Operation Marlborough, killing three members of AQI. On 27 February 2011, during the Libyan Civil War, the BBC reported that C Squadron assisted in the evacuation of 150 oil workers in three flights by RAF C-130 Hercules from an airfield near Zella to Valletta. On 8 March 2012, a small Special Boat Service (SBS) team, attempted to rescue two hostages, Chris McManus (British) and Franco Lamolinara (Italian), being held in Nigeria by members of the Boko Haram terrorist organisation loyal to al-Qaeda. The two hostages were killed before or during the rescue attempt. All the hostage takers were reportedly killed. The Ministry of Defence does not comment on special forces matters, therefore little verifiable information exists in the public domain. The SBS is under the Operational Command of Director Special Forces and are based in Hamworthy barracks, Poole, Dorset. In 1987, when renamed the Special Boat Service, the SBS was also reformed along SAS lines, with 16 man troops instead of the traditional sections. About 200–250 men make up the SBS at any one time, and once qualified, personnel are known as "Swimmer Canoeists". They are experts in swimming, diving, parachuting, navigation, demolition and reconnaissance. Since the SBS joined the UKSF Group in the 1980s, it has been restructured. Instead of one squadron being tasked with a permanent role the unit adopted the same system of squadron rotation as the SAS. Each Squadron rotates through counter terrorism duties and conventional operations and tasking. For example, in December 2001 it was C squadron who were on MCT Role and were called in to intercept the MV Nisha while M and Z Squadron were deployed in Afghanistan. SBS Reserve or SBS(R) – provides individual reservists to augment the regular SBS, rather than forming independent teams. Only candidates with previous military experience are eligible to enlist. The SBS(R) is based at various locations throughout the United Kingdom, but training is carried out in the South of England. In times of armed conflict and war, the SBS and SAS are required to operate in small parties in enemy-controlled territory. Operations of this nature require men of courage and high morale who have excellent tactical awareness be it knowledge of special tactics or simply knowing one's place in a polyvalent unit. Self-discipline neatly ties into this. Intelligence, reliability, determination and also being physically fit are key skills. Candidates wishing to serve with the Special Boat Service must have completed at least two years regular service and will only be accepted into the SBS after completion of the selection process. Until recently, the SBS had its own independent selection programme in order to qualify as a Swimmer Canoeist, but its selection programme has now been integrated into a joint UKSF selection alongside candidates for the Special Air Service. All members of the United Kingdom Armed Forces can be considered for special forces selection,[nb 2] but historically the majority of candidates have an airborne forces background. There are two selections a year, one in winter and the other in summer, and all the instructors are full members of the Special Air Service Regiment. Before being accepted onto a UKSF Selection course, a candidate must complete a two-week Special Forces Briefing Course. The course tests the candidates' physical fitness and observes their willingness to conduct water-borne operations. The Aptitude Phase is designed to select those individuals who are suitable for special forces training. The initial three weeks are devoted to gradual physical training and progressive exercises designed to develop physical and navigational ability. Candidates will be expected to complete the Basic Combat Fitness Test (Infantry) on the first day of the course. Exercise HIGH WALK (Fan Dance) will take place on Day 6 and takes the form of an escorted hill march over approximately 23 km (14 mi). As with all assessment marches, additional time may be added for inclement weather conditions. Exercise HIGH WALK identifies those individuals that are not adequately prepared to continue on the course. All other training during this initial period is directed at preparing volunteers for "Test Week" which is the fourth and final week of the Aptitude phase. "Test Week" consists of five timed marches of between 23–28 km (14–17 mi) conducted on consecutive days, followed by a final endurance march of 64 km (40 mi); candidates must complete this within 20 hours. Bergen weights carried during "Test Week" increase from 40 lb (18 kg) to 55 lb (25 kg) for the endurance march; in addition a rifle is carried on all marches. Volunteers are also required to pass the UKSF swimming test that consists of high water entry (3 m, 9.8 ft), treading water for nine minutes followed immediately by a swim of 500 m (1,600 ft) wearing Combat 95. The test finishes with an underwater swim of 10 m (33 ft) including a retrieval of a small weight. Those who pass the Aptitude Phase will undertake an intensive period of instruction and assessment of Special Forces Tactics, Techniques and Procedures (TTPs), including SF weapons and Standard Operation Procedures. The majority of this period is spent in the jungle, an environment that is suitable for SF training and ideal to achieve the purpose of this phase. Much of the training is aimed at discovering an individual's qualities. Continuation training, which consists of SOP and Tactical training in temperate and jungle environments, lasts nine weeks. This is conducted in the UK and Brunei. When accepted into an operational squadron, the candidates must complete the SBS Swimmer Canoeist Course, SC3 Course. The course lasts for several months and covers long distance Dives, Swims and Kayaks in open sea, often in poor weather. Underwater demolitions, Maritime counter terrorism, are also practised. On completing SBS troopers will be put on one year probation. Their training involves parachute exercises, helicopter training and boat training, which recruits will get the chance to earn their licence for. The Special Boat Service wear the green commando beret, but with their own cap badge. Colt Canada C7 5.56x45mm- C8 SFW variant is used. Heckler & Koch HK33 5.56x45mm- HK53 variant is used which replaced the MC51. Heckler & Koch G3 7.62x51mm- MC51 variant was used and it featured a suppressor. It was replaced by the HK53 as its recoil was not as controllable as the 5.56x45mm in the HK53. SIG-Sauer P226 9x19mm- P226R pistol which is the standard sidearm replacing the Browning Hi Power as it did with the Special Air Service (SAS). Sterling sub-machine gun 9x19mm- Was used as the L34A1 with a suppressor. Stratton - a 2017 film starring Dominic Cooper as an SBS operator working with MI6 to bring down a Russian ex-FSB agent turned rogue who plans to detonate a dirty bomb in the UK. Strike Back - a 2010 television show starring Philip Winchester as Michael Stonebridge, a former SBS operator recruited into section 20, a secret UK Ministry of Defense anti-terrorism unit. ^ The regular elements of United Kingdom Special Forces never recruit directly from the general public. ^ a b c OC SBS. "The New SBS Cap Badge". The Globe & Laurel - The journal of the Royal Marines (November/December 2003 ed.). Richmond, Surrey: Simpson Drewett & Co Ltd. ISSN 0017-1204. ^ a b "Col Richard Pickup — Obituary". The Daily Telegraph. 11 May 2009. Archived from the original on 25 May 2010. Retrieved 9 April 2010. ^ a b Kay, John. "Secret Service gets badge". The Sun. Archived from the original on 14 October 2012. ^ "British soldier drowns ISIS in puddle; SBS Troops in Mosul, Iraq". The Sun. 1 July 2017. Archived from the original on 11 January 2018. Retrieved 10 January 2018. ^ "British SAS troops injured fighting ISIS near Mosul, Iraq". The Independent. 6 February 2016. Archived from the original on 16 July 2017. Retrieved 10 January 2018. ^ "The Captain General". Royal Marines. Archived from the original on 14 October 2008. Retrieved 9 March 2010. ^ "Lord Boyce". The White Ensign Association. Archived from the original on 29 November 2010. Retrieved 9 March 2010. ^ "Prime Ministers Questions, Special Forces". Parliament of the United Kingdom. Archived from the original on 24 April 2010. Retrieved 14 April 2010. ^ "Special Forces". Parliament of the United Kingdom. Archived from the original on 25 April 2010. Retrieved 14 April 2010. ^ "Obituary, Commander Michael St John". The Daily Telegraph. 22 March 2009. Archived from the original on 4 June 2009. Retrieved 17 March 2010. ^ Dear, I. C. B.; Foot, M. R. D. (2001). "Special Boat Section". The Oxford Companion to World War II. ^ Paul, James; Spirit, Martin (2000). "The Special Boat Service". Britain's Small Wars Site Index. Archived from the original (Web) on 4 March 2010. Retrieved 9 March 2010. ^ "QE2 History". Chris' Cunard Page. Archived from the original on 31 May 2010. Retrieved 5 January 2010. ^ a b Hennessy & Jinks 2015. ^ "Other Marine units". Ministry of Defence (United Kingdom). Archived from the original on 6 December 2009. Retrieved 16 March 2010. ^ "The secretive sister of the SAS". BBC News. 16 November 2001. Archived from the original on 14 February 2008. Retrieved 10 March 2010. ^ "Marines in spearhead". Navy News - the official newspaper of the Royal Navy. Ministry of Defence: 1. October 1999. ISSN 0028-1670. Archived from the original on 9 November 2016. Retrieved 8 November 2016. ^ a b c Farrell, John (2000). Peace Makers: INTERFETs Liberation of East Timor. Rocklea: Fullbore. ISBN 0-646-39424-X. ^ a b c Benjamin James Morgan (6 January 2006). "A Brief History of Australian Army Operations in East Timor, 1999-2005". Archived from the original on 22 October 2009. ^ "British troops start work in East Timor". BBC News. 20 September 1999. Archived from the original on 5 April 2010. Retrieved 11 September 2009. ^ "MC Award puts Royal Marine in record book". Navy News - the official newspaper of the Royal Navy. Ministry of Defence: 2. December 2000. ISSN 0028-1670. Archived from the original on 9 November 2016. Retrieved 8 November 2016. ^ "No. 56017". The London Gazette (Supplement). 3 November 2000. p. 12363. ^ a b Rayment, Sean (1 August 2004). "End your rift, SAS and SBS are told". The Daily Telegraph. Archived from the original on 10 October 2011. Retrieved 9 March 2010. ^ Sengupta, Kim (3 December 2001). "British forces to take part in assault on cave complex". The Independent. Archived from the original on 25 September 2015. Retrieved 9 March 2010. ^ Smith, Michael (11 January 2003). "US honours Briton in Afghan raid". The Daily Telegraph. Archived from the original on 11 November 2012. Retrieved 10 March 2010. ^ "British special forces member killed in Afghanistan". the guardian. 2 July 2010. Archived from the original on 17 August 2016. Retrieved 16 December 2016. ^ "Hero killed in Taliban ambush". The Sun. 28 February 2008. Archived from the original on 5 January 2010. Retrieved 16 March 2010. ^ "Killed NI soldier 'was due home". BBC News. 6 July 2006. Archived from the original on 25 February 2008. Retrieved 9 March 2010. ^ Leithead, Alastair (25 June 2007). "Long haul fight to defeat the Taliban". BBC News. Archived from the original on 18 August 2010. Retrieved 9 March 2010. ^ "Royal Marine killed in Taliban fight named". The Telegraph. 1 August 2007. Archived from the original on 5 December 2017. Retrieved 2 April 2018. ^ "Lance Corporal Michael Jones Royal Marines killed in Afghanistan". Gov.uk. 31 July 2007. Archived from the original on 5 December 2017. Retrieved 4 December 2017. ^ "Dead UK Afghanistan marine named". BBC. 31 July 2007. Archived from the original on 28 October 2018. Retrieved 4 December 2017. ^ "Elite UK troops rescue Italians in Afghanistan". the guardian. 25 September 2007. Archived from the original on 5 October 2016. Retrieved 16 December 2016. ^ "British forces help free Italians in Afghanistan". the telegraph. 25 September 2007. Archived from the original on 28 October 2018. Retrieved 2 April 2018. ^ "Mullah Abdul Matin". The Scotsman. 22 February 2008. Retrieved 16 March 2010. ^ Harding, Thomas (18 February 2009). "British forces in Afghanistan seize £50m of heroin and kill 20 Taliban". The Telegraph. Archived from the original on 24 March 2016. Retrieved 3 December 2015. ^ "#IRemember: 'SAS Who Dares Wins' Stars Sign Up". forces.net. 27 November 2016. Archived from the original on 5 December 2017. Retrieved 4 December 2017. ^ "Sergeant Lee Andrew Houltram, Royal Marines, killed in Afghanistan on 29 August". Gov.UK. 30 August 2009. Archived from the original on 5 December 2017. Retrieved 4 December 2017. ^ "British soldier killed during rescue of kidnapped journalist in Afghanistan". The Guardian. 9 September 2009. Archived from the original on 16 August 2016. Retrieved 16 December 2016. ^ Pierce, Andrew (9 September 2009). "Army anger as soldier killed saving journalist who ignored Taliban warning". The Daily Telegraph. Archived from the original on 3 September 2013. Retrieved 8 October 2013. ^ "Marine Cpl Seth Stephens shot in the head by Afghanistan insurgent". BBC news. 24 May 2011. Archived from the original on 27 November 2018. Retrieved 21 June 2018. ^ Stone, Mark (18 April 2012). "UK Troops Crucial in Ending Kabul Attack". Sky News. Archived from the original on 27 April 2014. Retrieved 18 April 2012. ^ "Special forces dog wins 'animal Victoria Cross' for Taliban raid heroics". The Telegraph. 17 November 2017. Archived from the original on 9 April 2018. Retrieved 2 April 2018. ^ Farmer, Ben (27 November 2014). "Special Forces soldier died in perilous raid on Taliban haven". The Daily Telegraph. Archived from the original on 23 April 2015. Retrieved 29 June 2015. ^ "SAS on ground during Libya crisis". BBC News. 19 January 2012. Archived from the original on 17 November 2016. Retrieved 21 June 2018. ^ Watt, Nicholas; Norton-Taylor, Richard; Vogt, Andrea (8 March 2012). "British and Italian hostages killed in Nigeria". The Guardian. Archived from the original on 11 September 2015. Retrieved 8 March 2012. ^ "Special forces quitting to cash in on Iraq". The Scotsman. Archived from the original on 15 June 2011. Retrieved 9 March 2010. ^ "The arrested development of UK special forces and the global war on terror". Cambridge University Press. Retrieved 17 March 2010. ^ MacErlean, Neasa (13 May 2002). "The Special Boat Service". The Guardian. Archived from the original on 13 June 2014. Retrieved 10 March 2010. ^ "Career Specialisations". Ministry of Defence (United Kingdom). Archived from the original on 12 February 2010. Retrieved 9 March 2010. ^ a b "Special Boat Service (Reserve)". Ministry of Defence (United Kingdom). Archived from the original on 15 March 2010. Retrieved 8 March 2010. ^ "How do you join the SBS (Special Boat Service)?". Royal Marines. Archived from the original on 6 August 2009. Retrieved 7 June 2009. ^ "Mark Llewhellin interviews SAS Who Dares Wins TV Show Star "Ollie" Ollerton". 10 August 2016. Retrieved 3 September 2016 – via YouTube. Bijl van der, Nick; Hannon, Paul (1995). The Royal Marines 1939–93. Osprey Publishing. ISBN 1-85532-388-5. Chappell, Mike (1996). Army Commandos 1940–1945. Elite Series # 64. Osprey Publishing. ISBN 1-85532-579-9. Haskew, Michael E. (2007). Encyclopaedia of Elite Forces in the Second World War. Pen and Sword. ISBN 978-1-84415-577-4. Hennessy, Peter; Jinks, James (2015). The silent deep : the Royal Navy Submarine Service since 1945. London, United Kingdom: Allen Lane. ISBN 9781846145803. Jackson, Ashley (2006). The British Empire and the Second World War. Continuum International Publishing Group. ISBN 1-85285-417-0. Kennedy, Greg (2005). British Naval Strategy East of Suez, 1900–2000: Influences and Actions. Routledge. ISBN 0-7146-5539-2. Owen, James (2012). Commando. Little, Brown. ISBN 978-1-4087-0302-1. Richards, Brooks (2004). Secret Flotillas: Clandestine Sea Operations in the Mediterranean, North Africa and the Adriatic, 1940–1944. Routledge. ISBN 0-7146-5314-4. Urban, Mark (2012). Task Force Black: The Explosive True Story of the Secret Special Forces War in Iraq. St. Martin's: Griffin. ISBN 978-1250006967. Warner, Philip (1983). The SBS. Sphere Books. ISBN 0-7221-8911-7. Courtney, G.B. (1983). SBS in World War Two : the story of the original Special Boat Section of the Army Commandos. London: Robert Hale. ISBN 9780709012917. Falconer, Duncan (1998). First into Action : a dramatic personal account of life in the SBS. London: Little, Brown. ISBN 9780316645683. Hunter, Robin (1998). True stories of the SBS : a history of canoe raiding and underwater warfare. London: Virgin. ISBN 9780753502679. Ladd, James D. (1983). SBS : the invisible raiders : the history of the Special Boat Squadron from World War Two to the present. London: Arms and Armour. ISBN 9780853685937. Lodwick, John (1990). Raiders from the sea : the story of the Special Boat Service in WWII (first published 1947 as The filibusters ed.). London: Greenhill. ISBN 9781853670688. Mercer, Peter (1999). Not by strength, by guile. London: Blake. ISBN 9781857823684. Parker, John (2004) . SBS: the inside story of the Special Boat Service (Revised 2nd (2003) ed.). London: Headline. ISBN 9780755312252.